Like animals, plants possess an innate immune system and are capable of defending themselves against invading pathogenic microbes. Innate immune responses must be tightly controlled so that they are sufficiently robust and at the same time not over-reacting. Uncontrolled immune responses impair growth and development in plants and cause autoimmune diseases in humans. A team led by ZHOU Jian-Min at Institute of Genetics and Development Biology of Chinese Academy of Sciences discovered how plants deploy a sophisticated mechanism to accurately control immune responses. Innate immunity relies on a number of proteins called immune receptors that detect microbial molecules and pass the information to downstream proteins, which then activate defense responses. The researchers previously found that a protein kinase called BIK1 is a central player that relays signals from multiple immune receptors to diverse cellular defenses. BIK1 is rate-limiting component, whose phosphorylation and accumulation are central to immune signal propagation. The accumulation of BIK1 is controlled positively by several proteins called heterotrimeric G proteins and negatively by a protein called calcium-dependent protein kinase CPK28. In the current study, they show that a pair of ubiquitin E3 ligases called PUB25 and PUB26 are responsible for adding poly-ubiquitin chains to BIK1, which mark BIK1 for degradation and negatively regulate BIK1-mediated immunity. 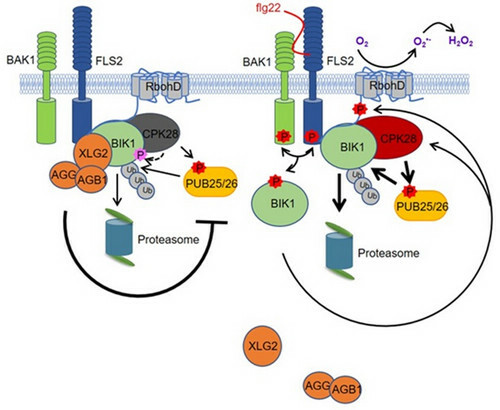 Both CPK28 and the heterotrimeric G proteins regulate BIK1 stability through PUB25/26. In the resting state, meaning that the immune receptors and BIK1 are not activated, heterotrimeric G proteins directly inhibit PUB25/26 E3 activity to stabilize BIK1, positively regulating plant immunity. Upon activation of immune receptors, CPK28 specifically phosphorylates a conserved residue in PUB25/26 to enhance their activity and accelerate BIK1 degradation, thereby negatively regulating plant immunity. Interestingly, PUB25/26 specifically target non-activated BIK1, suggesting that activated BIK1 is maintained for immune signaling. This study revealed that PUB25/26, CPK28 and heterotrimeric G proteins form a regulatory module which acts like a thermostat to dynamically control the homeostasis of BIK1 and immunity. The findings are published online in Molecular Cell entitled “A regulatory module controlling homeostasis of a plant immune kinase”(http://dx.doi.org/10.1016/j.molcel.2017.12.026 ). The work was conducted in collaboration with Prof. Cyril Zipfel at the Sainsbury Laboratory and Jacqueline Monaghan at Queen’s University. Dr. WANG Jinlong is the first author of the paper. This work was supported by National Natural Science Foundation of China, the Strategic Priority Research Program of the Chinese Academy of Sciences, and the State Key Laboratory of Plant Genomics.